Garden Jobs in Autumn-Don't Forget The Lawn. So don’t procrastinate, spend a bit of time each day to get through what seems to be rather a big workload that seems to be the gardener’s lot during this pleasant gardening season. Let’s find out what preparation you need to do for your lawn . The big tip from Glenice was don’t cut your lawn back too hard so that it can replenish itself, because as the weather cools, growth on most plants has slowed down. While you're at it, yo might as well do the lawn edges. Then the next thing is to aerate the lawn with a garden fork or those weirdo sandaly things you can strap to your shoes that have spikes. A bit like golf shoes? Finally, give the lawn some fertiliser, whatever you like really. There's even lawn fertiliser that claim don't need to be watered in. 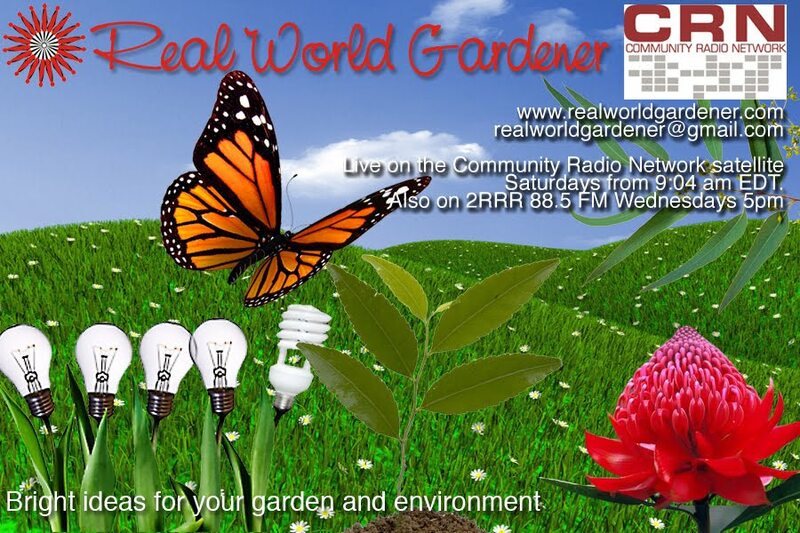 If you have any questions about where to get Autumn gardening, drop us a line to realworldgardener@gmail.com or write in to 2RRR P.O. Box 644 Gladesville NSW 1675. Did you know that Germans still brew horseradish schnapps and some also add it to their beer? Apparently the Egyptians knew about horseradish as far back as 1500 B.C. And early Greeks used it as a rub for low back pain and as an aphrodisiac. In the 1600s, Englishmen loved to eat their beef and oysters with horseradish. But not only that, the loved it so much, that the English, grew it at inns and coach stations, to make cordials to revive exhausted travellers. Gardeners grow horseradish for its thick, fleshy white roots. Did you know that the bite and aroma of horseradish root is totally missing until it’s grated or ground? That’s because as soon as the root cells are crushed, volatile oils known as isothiocyanate (ISO-THIGH-O SIGH-A-NATE) are released. Vinegar stops this reaction and stabilizes the flavour. Very similar to Wasabi really. If you’re interested in making your own horseradish, and you don’t want it too hot and bitey, just add the vinegar straight away..
Horseradish is a perennial to 1.5m high above ground but below ground there is a parsnip like tapering, fleshy taproot to 60cm long and 5 cm thick. The above ground parts look like lime green large rough textured leaves, 30-90 cm long, so that’s about 1-3 ruler lengths. The edges of the leaves are extremely saw toothed, or serrated and as botanists and horticulturalists say, leaves with toothed margins. 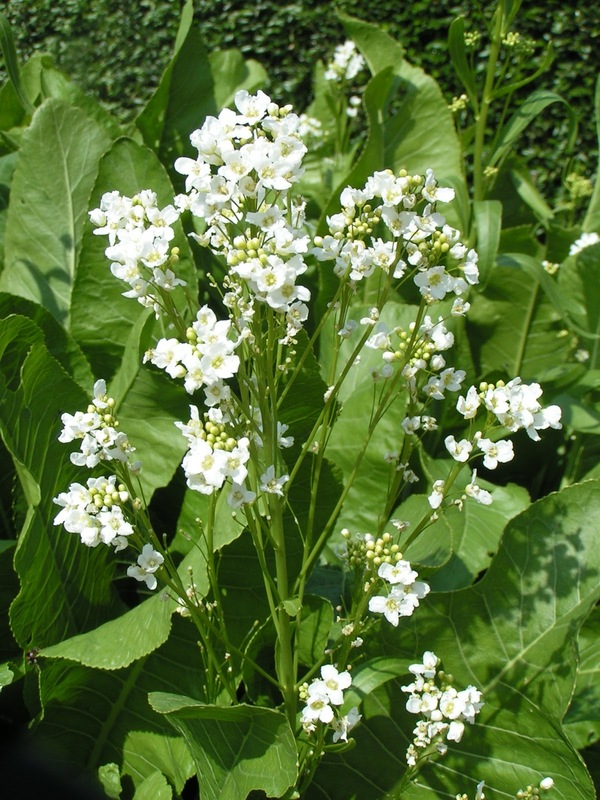 Horseradish has white flowers in the middle of summer to mid-autumn. Plant your horseradish in a permanent position and don’t disturb it because new plants will spring up from any broken roots and will quickly spread throughout the garden bed. Horseradish can grow in most soils even damp soils and grows quite quickly. TIP: This deep rooted plant can be used in orchards to open up compacted soils and return nutrients to the surface of the soil. By far the easiest way to grow Horseradish is from root cuttings. Now’s the time to get a piece from a friend or your friendly garden club members because Horseradish is propagated by root division in spring or autumn for harvest the following year. If you know someone who has it in their garden, just one piece of root will start off for you. Don't worry too much about soil or position, because it won’t although too much shade and it’ll die off. Lay the roots of horseradish on this about 30cm apart and then cover with more soil. Keep your horseradish well watered. Next year by mid-autumn if you were lucky enough to have planted it last year either in autumn OR spring, the roots should be ready to harvest. What to make with horseradish? Use the larger roots to make horseradish sauce and store the smaller ones in sand for replanting next year. You could plant some of the smaller shoots in pots – either give them away or sell them once they start showing signs of growth. 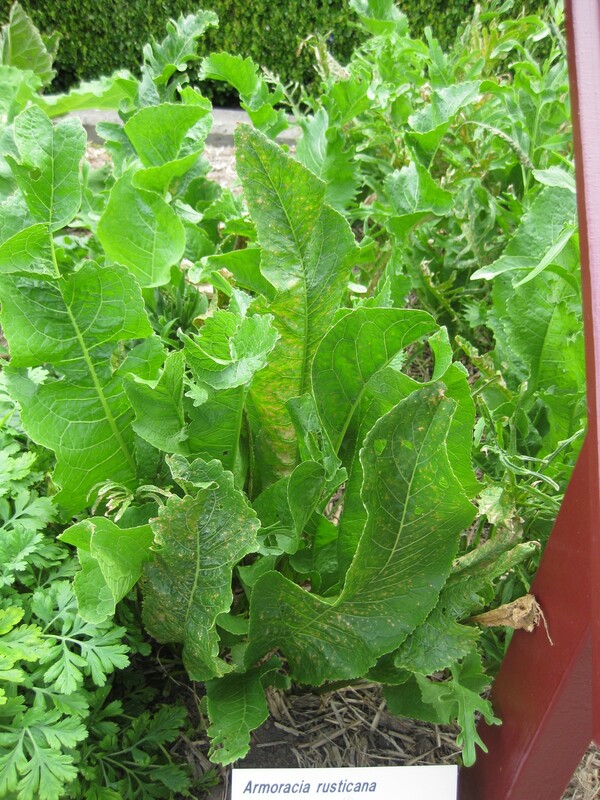 By digging up all the plants, you’ll prevent the horseradish from getting out of control and taking over your garden. Although I must say, in my garden it’s extremely well behaved. I have found suggestions that sinking half of an old rubbish bin into the ground, with its bottom removed stops its spread. 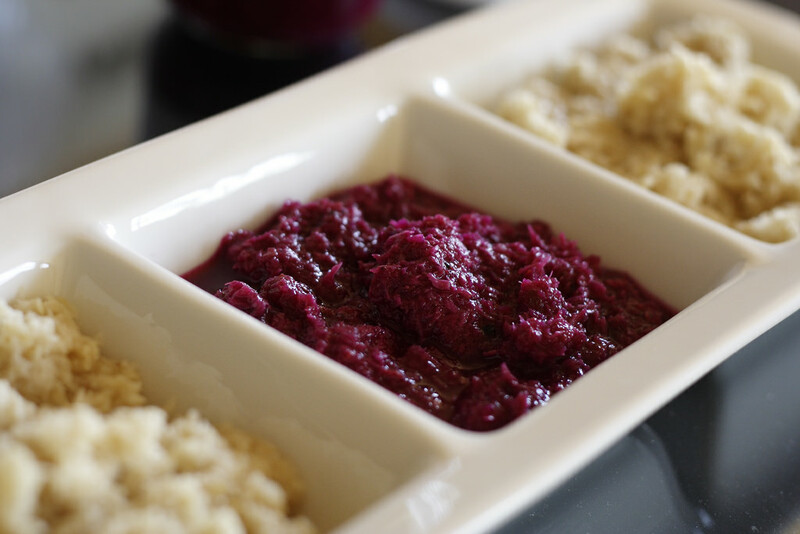 Horseradish is very versatile – not just as a sauce with beef, but it goes well with smoked mackerel, sausages, ham, trout, eggs and avocado. Why is horseradish good for you? Horseradish is a natural antibiotic. If you’re on a low salt diet, then horseradish is really useful as a seasoning. 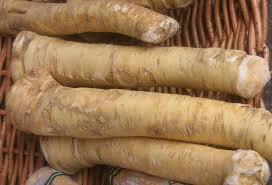 Horseradish has only 2 calories a teaspoon, is low in sodium and provides dietary fibre. Where do you get it? Well there’s an online company that has divisions, but they won’t be available until July. Otherwise, the herb section of most nurseries and garden centres do stock this plant. This tree might lose its leaves in Autumn, but for all those gardeners who don’t like deciduous trees, the bark is a feature in itself . The flowers are spectacular and some councils or even neighbours have decided to plant these as street trees. Jeremy’s dwarf cultivar that took 10 years in the making is still to be released. 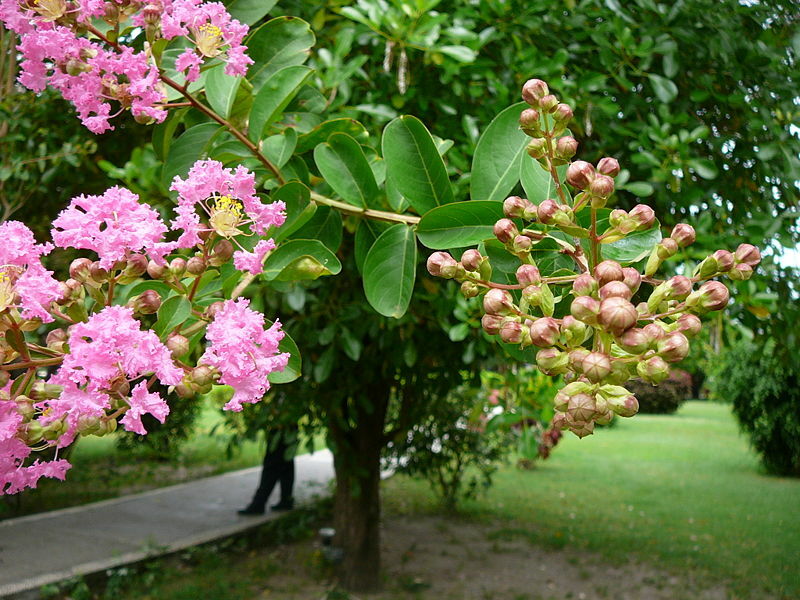 But there are other dwarf cultivars around such as Crepe Myrtle Little Chief. Colours of the flowers tend to be in the blue end of the spectrum from pale pink to deep crimson to purples and of course there’s the white colour. Crepe myrtles flower in summer and autumn in panicles of crinkled flowers with a crepe-like texture. 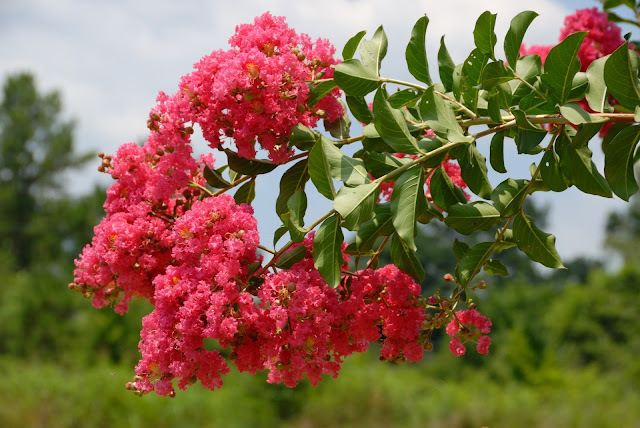 Karen mentioned that the crepe myrtle trees can be coppiced down to a stump about 1 and 1/2 metres of the ground each year, after they lose their leaves. They will reshoot quite quickly in Spring to give you a fabulous display.